Did it look like the photo/drawing on the pattern envelope once you were done sewing? Yes, although I think my jacket looks a little shorter than the one on the model. Were the instructions easy to follow? Yes! This jacket went together very quickly. Using my serger made it come together in a snap. The most time consuming aspect was the hemming and the button holes. I hand hemmed the jacket like the pattern instructions suggested. That took me at least thirty minutes, but I thought, what the hey? What did you particularly like or dislike about the pattern? 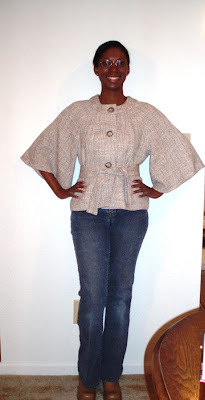 I like the exposed darts, the round collar, and the flared sleeves. Everying! Fabric Used: Beige/brown tweed from Fashion Fabrics Club. Pattern Alterations or any design changes you made: After Erica B.’s example, I tried bound button holes instead of the regular machine holes. Because the tweed frays pretty persistently, I thought the bound holes would have a nice finish and would keep any stray fibers from poking out. I followed the tutorial on Sew-4-Fun, and the button holes came out fairly well. Would you sew it again? Would you recommend it to others? I probably will not sew this jacket again. One is enough for me. But I would highly recommend this pattern to others. Conclusion It’s a cute style that can be worn with jeans or slacks. Keep up the good work, Linda. I’m sure you’ll get it finished in due time. Like your fabric choice. I am working on this jacket pattern, it is taking me forever to finish. And it is not that hard of a pattern to make.